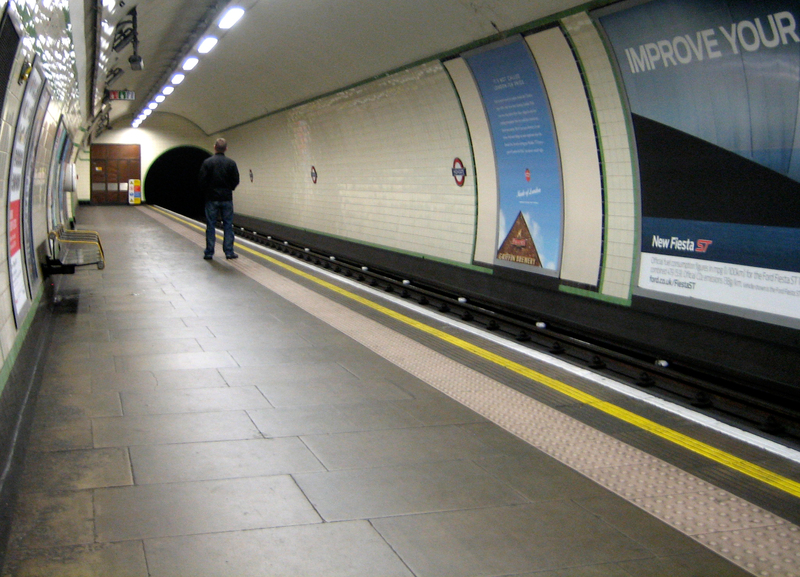 The arteries of the Underground can pull tight around your heart. The crescendo roar of a train as it rattles through a tunnel towards the platform plays with your emotions in much the same way as that of an impending public declaration of feelings. It finds parallels in the steeling of nerve and numbness of limbs that always comes before a moment of intimate confession or personal commitment. I love you. I don’t love you. I can’t bear it. I can’t live without it. The train charges at you with a force that jars and jangles both physically and psychologically. And you are reminded of other times in your life when every bone and sinew was a-flutter with the advent of something of equal provocation: a hello, a goodbye, a negotiation, a termination. The possibility of unbeatable joy. The probability of unbearable sorrow. It is one of the most bittersweet sensations there is, for just as that probability will always turn into a reality, so the train always arrives. There is always a resolution. You’ll either get together with that person, or you won’t. There’ll either be a happy ending, or there won’t. It’s life reduced to its most bitter, binary form. It is also the romance of the Underground. This is a very raw, primal experience. More so if you are alone, and it is just you and the steadily increasing proximity of something very very big and very very loud. As the train arrives, so you’re filled with tingling anticipation. Here we go, you think. This is it: the start of something. A beginning. A departure. I am about to let something happen. Even if you’re only travelling a couple of stops, it can still feel like you’re embarking on an adventure. Then off into the darkness, tracing a deep, sentimental geography. Conceiving encounters, reliving experiences, creating futures, revolving memories. Or, more than likely, burying those memories. The mixture of anonymity and noise is the ideal crucible into which to drop regrets, estrangements, farewells. To brood on what may have been, and whether it still can be. To nurse bereavements and doctor fantasies. To dream and dream and sometimes hope never to wake up. The Underground is the greatest matchmaker of the imagination. It’s the ideal sanctuary for romantics, from John Betjeman’s Cockney Amorist to Saint Etienne’s Girl VII. It’s emotion and motion combined. It’s electrical balm for the mind. …until the next station arrives, and your train exhales itself of another cargo of laughter and loss. Swallow your pain. Sigh no more. Wipe away the sweat, the tears, the make-believe years. This romance is over for now. It’s time to renew your affair with the sky. Forty years on from it being unremarkable, recalling that “wisp of warm air” just before the train enters the station does indeed “pull tight” around my heart. Meanwhile, #112 is as good a time as any to thank you, Ian, for producing such an elegantly crafted celebration of London’s railway arteries. I’ve read every entry, with a growing appreciation of your writing style. Like many others, I’m hoping that 150 is only an arbitrary stopping point. How about a loop line just past the depot? Thanks Geraldine, glad you’ve been enjoying the blog. There are indeed hundreds of admirable things about the Underground, but I wanted to challenge myself to select just the really great ones. As such I’m afraid number 150 will be the end of the line! What does it mean that I think I recognise that platform? Highgate station isn’t it? Southbound? Absolutely right! One of the nicest deep-level platforms, in part because it’s so (unnecessarily!) long. Great post. I agree with the primal feeling. I get this with all kinds of trains, not just the Tube. When I was at uni I used to go and watch freight trains screaming past the campus on the WCML at 2am in the morning [I was at Lancaster] and I grew up watching slam-doors race through South Croydon and the third rail arcing…. the whole experience is very primal indeed, the first whisper of the rails and then the noise increasing.